SUNLIT UPLANDS: Why Are Anti-TEA Party Liberals Campaigning for Michigan Senate Candidate Pete Hoekstra? Why Are Anti-TEA Party Liberals Campaigning for Michigan Senate Candidate Pete Hoekstra? DETROIT, MI - Republican U.S. Senate candidate Gary Glenn, whose candidacy is endorsed by a statewide coalition of over forty local TEA Parties in Michigan, Thursday advised TEA Party leaders that Teamster union president Jimmy Hoffa, Jr., is not the only anti-TEA Party liberal who has worked to help elect former nine-term Congressman Pete Hoekstra to political office. Hoekstra's past campaigns, including his 2010 campaign for governor, have been endorsed and/or funded by the Teamsters and Hoffa, who famously said at an Obama campaign rally last year regarding TEA Party members, "Let's take these sons of b-----s out." Glenn in an e-mail and Facebook message Thursday alerted TEA Party leaders that one of the top circulators this past spring of petitions to put Hoekstra on the August primary ballot was Keith Moore of Grand Rapids, who the Washington Examiner last month reported is a convicted felon who works as a professional petition circulator for PCI (Progressive Campaigns, Inc.) Consultants of Los Angeles. According to a 2010 report by Mackinac Center for Public Policy's Michigan Capitol Confidential, PCI is the same firm that gathered signatures in an attempt to put a slate of alleged "TEA Party" candidates on the Michigan ballot that year. Democratic operatives recruited candidates to run on the new "TEA Party" ticket in hopes of peeling conservative votes away from Republican candidates in order to help elect Democrats. The petitioning firm's website lists the Michigan Democratic Party as one of its clients, as well as left-wing billionaire George Soros, the American Civil Liberties Union, National Education Association, Service Employees International Union, and various other labor unions, animal rights, and environmental groups. "Republican primary voters have legitimate cause to be concerned not only about Hoekstra's voting record -- his votes for the $850 billion Wall Street bailout and the Brady Bill gun control law, and his opposition to Right to Work and the American Legion's Flag Protection Amendment -- but also about the anti-TEA Party liberals who've worked to support his political campaigns," Glenn said. "Congressman Hoekstra should explain not only his big-spending record and longstanding financial support from Hoffa, but why some of the same people who reportedly tried to sabotage Republicans with fake TEA Party candidates in 2010 would want Pete Hoekstra to be the Republican nominee for U.S. Senate in 2012," Glenn said. "Is it because they know he'd be the easiest Republican for Debbie Stabenow to beat once people learn about his voting record?" "And if a professional petition circulator reportedly convicted of forgery and fraud was paid to gather signatures for Congressman Hoekstra, did Pete fail to truthfully respond to reporters who asked if his campaign had hired paid petition circulators?" Glenn asked. "The more disturbing question is, if this guy wasn't paid, why would a professional petition circulator who works for a left-wing activist firm in California be volunteering for Hoekstra's campaign?" Glenn said. "Why do Jimmy Hoffa and other people hostile to TEA Party values want Pete Hoekstra back in Congress?" Glenn said that a member of the news media during a May interview about the nominating petition drive told him that Hoekstra had denied hiring professional petition circulators to help gather the 15,000 signatures of registered voters required by state law to appear on the ballot in August's Republican U.S. Senate primary election. Glenn's all-volunteer crew gathered over 27,000 signatures, more than Hoekstra and any other GOP Senate candidate. However, Hoekstra's nominating petitions reveal that one of his most prolific petitioners was Moore, who -- according to court documents reported by the Washington Examiner regarding a Maryland lawsuit -- has a lengthy criminal record. The Examiner reported June 7th: "One felon, Keith Gregory Moore, of Grand Rapids, Mich., was convicted of forgery, fraud, aggravated assault and home invasion, the court filing shows. ...(Moore was) hired by California's PCI Consultants, which (Montgomery County police union officials) contracted to gather signatures." 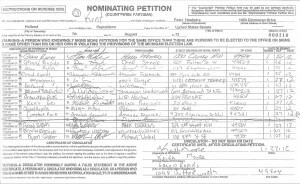 Montgomery County officials asked the court to declare invalid the signatures Moore gathered for a union-backed petition drive there since under Maryland law, as a convicted felon, he would be ineligible to vote.